Around 120 uprooted Tamil villagers from Mu'l'lik-ku'lam in Musali divison of Mannaar mainland on Thursday morning launched a protest with a vow to continue and step up their struggle to liberate their village. The struggle was inspired by the continuous protest by the people of Keappaa-pulavu in Mullaith-theevu district, who have been waging their struggle for almost two months now. The uprooted Tamils residing at Malang-ku'lam and Kaayaa-kuzhi gathered along Mannaar - Puththa'lam Highway announcing their struggle. SL Navy and a Sinhala Assistant Divisional Secretary were threatening and harassing the people to end their protest. However, the protest continues. Around 350 people belonging to 176 families, who moved closer to jungle outlets near Mu'l'likku'lam, at Malang-kaadu and Kaayaa-kuzhi, have been languishing for almost five years without basic facilities. Another 100 families uprooted from Mu'l'lik-ku'lam are still residing elsewhere in Mannaar district. Musali division was under LTTE administration during the times of war and the people from Musali were chased out of their village in September 2007. After the genocidal onslaught on Vanni in 2009, the occupying SL Navy has transformed Mu'l'lik-ku'lam into the Command Headquarters of its so-called “North Western Naval Area”. Apart from the houses and residential lands, there are hundreds of acres of agricultural lands with more than 7 agricultural tanks that remain under the control of the occupying SL Navy. Churches, schools, a fisheries jetty, play ground and an MPCS building are also under the military control, the protesting people said. 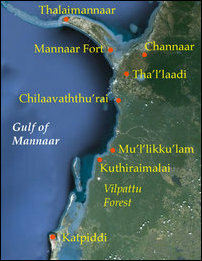 Mu'l'likku'lam, bordering Puththa'lam district is located in 46 km south of Mannaar town, 36 km south of Vangkaalai and 20 km south of Chilaavaththu'rai. It has become a strategic point of occupation to the Sri Lankan forces that aim to Sinhalicise and colonise the land and the historic waters of Eezham Tamils. There were 274 houses in the village. 25% of the houses were cadjan huts. Apart from the cadjan huts, all the stone buildings survived the war. At least 26 houses of the large houses that belonged to the villagers are being used by the SL Navy as residential offices for naval commanders and for other military purposes. The occupying Sri Lanka Army handed over the village to the SL Navy in 2008. After the families moved closer to Mu'l'likku'lam, the SL Navy constructed 27 stone houses for the owners of the 26 houses elsewhere. But, these houses are already damaged due to poor construction, the uprooted people said. 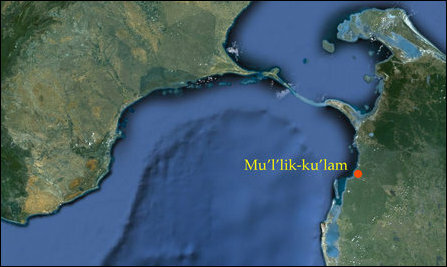 The river flowing and entering the Gulf of Mannaar at Mu'l'likku'lam is the boundary between the Northern and the North Western Provinces. The Vilpattu reserved forest south of the boundary was scattered with a number of Tamil villages before it was declared a reserved forest in 1903. The Tamil territory was contiguous up to Negombo in the Western Province at that time, before the Sinhalicisation of the Tamil Catholics of today's Puththa'lam and Gampaha districts.